Startech Muy1mff 6" Stereo Spl..
90% Spiral Wrapped Connector-provides shielding against EMI and RFI interference Y adapter allows you to split a signal or adapt from one connection to another Gold Terminals ensure long lasting, corrosion free connections Fully molded-strain relief for maximum flexibility High quality 26AWG 90% Spiral Wrapped Connector-provides shielding against EMI and RFI interference Y adapter allows you to split a signal or adapt from one connection to anothe This 3.5mm Stereo Splitter Cable/Y-cable features one 3.5mm male and two 3.5mm Female audio connectors, splitting a single headphone jack into two. 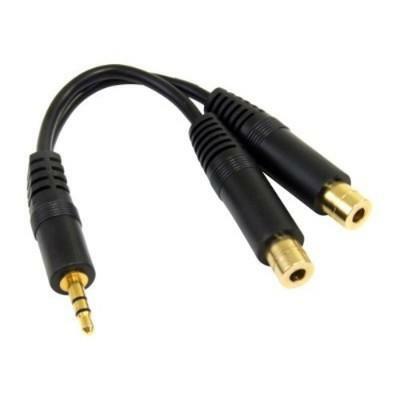 A practical, cost-effective audio solution, the 3.5mm stereo splitter cable features fully molded strain relief for long-lasting durability and high quality gold terminals to ensure corrosion-free connections. The 3.5mm audio splitter/Y-cable is backed by StarTech.com's Lifetime warranty. 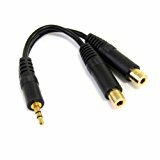 StarTech.com MUY1MFF 6-Inch Stereo Splitter Cable- 3.5mm Male to.. I know what other reviewers are complaining about when it comes with the actual connection of the headphone jack, but I just got it in place and left it. The wife and I use it in bed so we can watch TV without waking our son. I just set the headphone jacks in the correct position and don't move them. It can be a pain sometimes, but I just deal with it.This is being used on a Roku 4 remote with no issues of sound level, we both are able to hear the TV/movie just f..
StarTech.com MUY1MFFS 3.5mm Male to 2 x 3.5mm Female Slim Stereo.. I tried a few "splitter" cables at RatShack and Amazon that were actually not signal splitters, but they were signal separaters. That is, they would split a stereo signal into two separate leads -- one with the left and one with the right channel. It was really frustrating, but this cable actually is a signal splitter. If you want to share your laptop's, phone's, or tablet's audio with 2 outputs, then this is the cable to g..